Gaining weight is easy but losing it is far from it and I was certainly starting to pile on those pounds! As it seems the norm these days I wanted a quick fix and turned to supplements to try and help me with my weight loss, had varied results with the ones I tried but nothing to write home about. 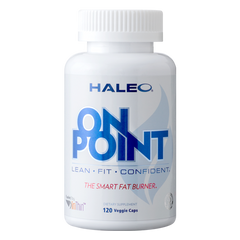 I eventually stumbled across a new product called Haleo On Point and thought OK let's give this puppy a try after all can't be any worse than any of the others can it? Well I can comfortably say that I was glad I did, finally I was starting to shed a few extra pounds and move towards that desired lean body shape, OK maybe not quite Hugh Jackman but at least not Chris Farley anymore!. My journey started just like any other at the beginning, with a bulging middle phase which is only just starting to fade into the ending but at least the main hero of this story is fighting the fat monster and winning. Seriously though it was all too easy to piles on those pounds, few beers here, some chocolate there, bit of desert after a nice meal then top all that off with 'too tired for gym today', 'I'll hit the gym harder tomorrow', 'Monday, I'll start again on Monday.....', any of that sound familiar? Needless to say that after the days turned to weeks and weeks to months the pounds started building up as did my mid-section. I started to notice that my shirts were that little bit tighter, I could no longer get into certain jeans and as if that wasn't enough I started getting out of breath after brief walks or when going up the stairs one or two floors at work. No it had become apparent I needed to start shifting this tyre before it moved in permanently. So back to the supplement then, at first I was pretty apprehensive as I have taken other thermogenics/fat burners and suffered heartburn, the dreaded jitters (where everyone at work would look at you thinking you was on crack cocaine or something! ), excessive sweating was another unsightly side effect I have had to endure when using thermogenics and taste, some products taste so rank you can barely keep it down long enough to have any affect at all but I'm happy to report that Haleo On Point, for me at least had none of these unwanted side effects. After the just first week I started to notice positive results and with continued use you see improved results but as with any fat burner you need to take a break after a couple of weeks to allow your body to recover. I did feel more energetic when using it and that lead to me actually hitting the gym for a change. Those stairs were not so much of a problem much to my relief and actually prompted me to use the stairs more often, in fact I rarely use the lift anymore. It also helps in reducing the hunger pangs thus leading to less snacking and more a healthy diet, so less nibbling on choccy bars and more fruit. I was finally getting into a position where I was becoming able to take control of my exercise and diet and not the other way round. I wouldn't go as far as to say that it was some kind of miracle worker and that I am now superman, god no hahaha, but it has helped me start shifting that unwanted weight and get back on track.